What could top the “Got Milk?” campaign from the 1990s? The Happy Cows campaign from California! Apparently there’s a bit of competition between USA states for buyers of cheese. Hmmm will I get Vermont cheese or California cheese? To help people decide, the California Milk Advisory Board commissioned Deutsch Los Angeles to make some very expensive but very effective TV ads. The result? A series of vignettes in which we are informed that dairy cows living in California just love it there. So the milk has to be better! On the Real California Cheese web site there are three of the TV spots available. Big Sheep – reminiscent of Braveheart. “Breaking Out” – a dairy farm set in the Arctic, or is it Vermont? “Girl Talk” – what the gender-related chat of cows might sound and look like. Click to get past the splash screen, then choose “Happy Cows”, and “Happy Cow TV”. While you’re there you can even download a happy cows calendar, or purchase a cute and cuddly set of happy cows puppets. Now what makes this campaign interesting is the ‘anti-campaign’ by PETA, People for the Ethical Treatment of Animals, found at www.unhappycows.com PETA took the California Milk Advisory Board to court for misrepresentation of the lot of dairy cows. According to their suit, dairy cows often have to put up with dusty, muddy and dirty conditions. Picturing them in green fields is misleading. The court suit was unsuccessful. It may have lead to a higher interest in the happy cows. And what do the happy/unhappy cows think of it all I wonder? 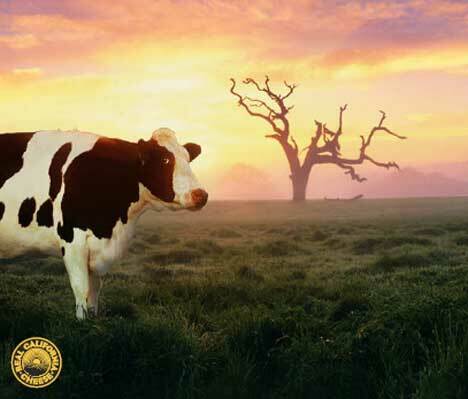 The Happy Cows campaign was developed at advertising agency Deutsch, Los Angeles by a large team, including President/Chief Creative Officer Eric Hirshberg, SVP/Associate Creative Director Karen Costello, SVP/Associate Creative Director Chris Rebeico, SVP/Associate CD/Art Director Michael Kadin, SVP/Associate CD/Copywriter Eric Springer, Sr. Art Director Dave Sakamoto, Art Director Yooly Mukai, Jr. Art Director Rachel Everett, Sr. Copywriter Craig Ghiglione, Jr. Copywriter Hilary Haselton, SVP/Director of Broadcast Production Randy Morton, VP/Executive Producer Steffi Binder, and Agency Producer Rebecca Darvin.